Quick: Get this Babka Out of the House!!! ...because i can't stop eating it! when i saw the article by my friend and esteemed colleague joan nathan in last wednesday's new york times, the texture and swirl of the crumb just drew me right in. i grew up on 95th street and central park west and my parents each went to eclair on a regular basis (eclair was mentioned in the article), my mother during the week to pick up my favorite whipped cream filled eclair and my father on sundays to pick up a babka. in my bread book i have recipes for brioche and for kugelhopf, both of which are similar to babka but not the same thing. 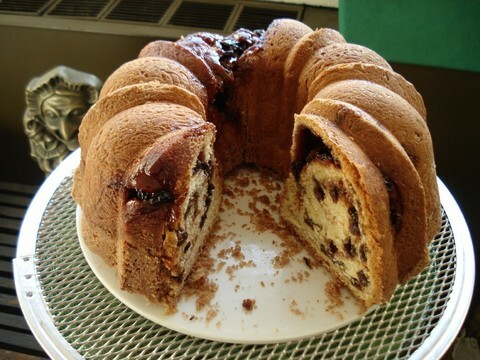 babka is somewhere between a rich coffee cake and a brioche. compared to my brioche it has about half the egg, two-thirds the butter, and about 1/3 cup more liquid. All this conspires to make a softer and lighter cake/bread. i am a great fan of ann amernick whose new book "the art of the dessert"(john wiley 2007) contains this recipe. you can also get the recipe by going to this link at the New York Times. you will find several choices of filling and topping. i used the cinnamon-raisin filling adapted from katja goldman, but soaked the raisins in rum as adapted from mrs. london's, saratoga springs, n.y. and i used ann's streusel topping with the cinnamon. here are a few of my baking notes: i like ann's use of part cake flour as it makes a more tender cake-like crumb but it also makes the dough fragile and prone to tearing so lift it carefully when placing it in the pan and if it tears as mine did, just pinch it together. it actually looks most attractive with some of the raisins and sugar spilling out and caramelizing on the crust. but i wouldn't try twisting it as indicated when placing it in the pan unless you use all unbleached all-purpose flour or you want it to break open. those of you who prefer weight to volume, the all-purpose flour (be sure to use unbleached or the dough will fall apart completely) is 10 ounces/285 grams and the cake flour 3 ounces/85 grams. alternatively use a total of 13 ounces/369 grams unbleached all-purpose flour. if you use instant yeast you can add it directly to the flour. use only 2 teaspoons and add the 1 tablespoon of water to the milk (which by the way i prefer to scald and then bring to room temperature before using). i also increased the salt from 1/8 teaspoon to 1/2 teaspoon. i used my nordicware "Classic Anniversary Bundt" which is non-stick and 15 cup capacity but the standard 12 cup bundt that's called for will work as it didn't come up to the very top of the pan. but the extra height did serve to shield the streusel topping so if using the 12 cup bundt you may want to tent it loosely with foil after the first 30 minutes of baking. by the way, i did not line the pan with parchment, but coated it with cooking spray and it released beautifully--even the escaped caramel part. my instant read thermometer registered 188˚F after 50 minutes of baking. i unmolded the babka onto a rack as soon as it came out of the oven. almost all of the streusel stayed on what was now the bottom. as it was 11:00 at night, and i didn't want to ruin the crisp crust and streusel by covering it, i stayed up to watch "kinsey" on the late show and by the time it was over the babka was completely cool! so i covered it with an inverted plastic box and dove into it this morning. when you see the photos i took you'll understand just why it provided such a temptation. by the way, the little brass doorstop in the photo is an antique punch and judy. i usually move it away from the best light location for photos but this time it seemed appropriate as babka means little old-lady. actually just old lady or grandmother but in my era they were always little (now we take calcium pills)! bubba, alta bubba, babcha--they're all yiddish and polish variations which sound as endearing, comforting, and lovable as this recipe. p.s. except for one piece, the missing part in the photo was all consumed by me within 10 minutes!